The Clan Montgomery Society will honor the overall champion of the US/Int Jousting Championship with a large Scottish Quaich suitable engraved and known as the Eglinton Cup which honors the Eglinton Tournament of 1839. Commador Angus Topshee NORAD and Peggy Young awards Charlie Andrews with the Quaich for the Overall Winner of the 2017Jousting Championship. 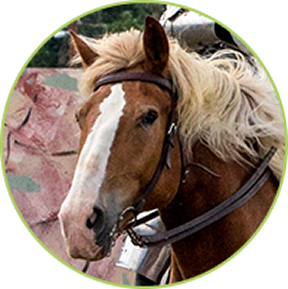 Jousting competitions will be held Friday will only have the Mounted Games starting at 9:30 am with Light Armor Joust at 12 noon with Heavy Armor Joust at 3:00 pm, Saturday, and Sunday Light Armor Joust begins at 10 a.m. and Heavy Armor Joust at 2:30 p.m. 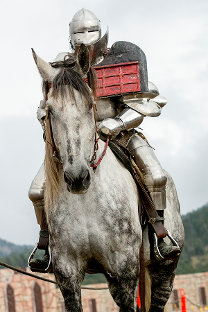 Heavy armor jousting was prominent in the 15th and 16th century. The purpose of the competition is for each competitor to try to dislodge the opponent from his/her horse. In light armor jousting the purpose is for the competitor to strike his opponent's shield at a designated spot. Both jousting events are dangerous and only for the bravest of competitors. To maximize the skills and effectiveness of knights and their steeds as a fighting unit, it was necessary to practice. These early skill-honing events were called melees and took place in a large field with no barriers between the opposing forces, who used their actual weapons. Of course, this led to many injuries. Changes were made to use blunted weapons and tilts, or fences. Further reductions in the number of combatants on the list, or field, at the same time led to the birth of the joust. A joust is a form of one-on-one combat between two knights on horseback. Armed with 10-foot-long lances, they gallop down the lists toward each other and score points by unseating their opponent or striking the shield. So many knights were killed in the early jousts the Pope and several kings banned jousting tournaments. English subjects were constantly excommunicated for persisting in the enjoyment of continuing tournaments. Soon the jousting became a contest between two combatants as it was easier to show one's skill outside the melee field. Training of knights began to include many of the exercises now popular with Scottish athletes, in addition to spearing small rings and quintain jousting. The phrase "Watch your back!" was most likely started by a quintain playing jouster.